Cover story on the December, 2013 Knife World Magazine! You can choose from my wide selection of knives on display. 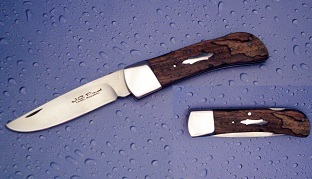 Knives are available in Smith & Sons Knives Store, Sack's Outdoors, Laurel Nursery and Garden, and Rock Hard Designs. If you can’t find what you need, I can make a custom knife to fit your needs. Visit my blog for news and upcoming events!